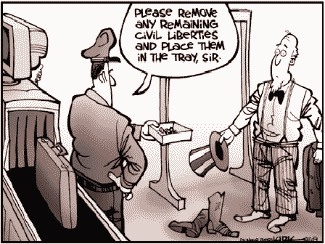 The Fourth Amendment to the Constitution protects us from illegal search and seizures! But not in Constitution free zones where it’s been abolished. My brother answered first: “visiting family.” Both my sisters-in-law answered the same. I really hate lying. It eats me up inside. So when my turn came around, I said: “To drink obscene amounts of alcohol, go clubbing, and chase hot Canadian women”. It was probably the most honest answer this young border control agent heard all day. “Do you have enough cash for your debauchery?” he asked. Besides looking at the old beef jerky in the car door, they didn’t even check the amount of alcohol we brought or unpack my sister-in-law’s shoe-filled trunk. I was secretly excited to see what would happen when we got to the border. You see, a couple weeks before I left, I heard the DHS (Department of Homeland Security) instituted a “Constitution-Free” zone within 100 miles of any U.S. border. In this zone, any agent can search and seize your property, including (but not limited to) laptops, tablets, and cell phones. We stopped at the border around noon for our “randomly-selected search”. So random, I’ve been in the same locked “waiting area” a dozen times. So random, in fact, one of the border agents knows my older brother by name! Watching fifteen cars go through, unchecked, right after us wasn’t uncommon. But, instead of the usual frustration, this time – I was a little giddy to see how far they would invade my privacy by looking through my electronics. “Give me your cell phones.” Straight to the point, huh? After handing them our only means of communication they sent us to the “waiting room” (I’ve never understood why a waiting room requires shatter-proof windows and a lock on the door). What exactly are they looking for? Contraband? Proof of wrong-doing? Pictures of me dancing with scantily-clad Canadian women? Little did he know, before I handed over my phone, I ran a little test. I left several text messages unread. I gave up the phone: the notifications blinking and all. When my phone was returned all six were viewed and the message screen scrolled all the way to the bottom. Obviously, they had no problem looking through my messages and phone calls – it confirmed all the rumors of border control agents seizing and searching without needing any approval whatsoever. If you look at the map below, some states are fully covered by this 100-mile radius. Actually – this rule affects nearly two out of three Americans. At this point, it’s hard to say we even have a constitution anymore. While both scary and disappointing, this is the world we live in now. As I travel with Bobby, I am considering leaving the U.S. and not coming back. I love my home, and I love what my country once stood for, but it isn’t quite loving me back these days. You used to only lock your doors to stop the bad guys out there. Now, the “good guys” want to steal your stuff too. It may be hard to distinguish who’s who in the next couple of years. On a brighter note, there are many tools and programs you can use to upgrade your privacy and security (like Cryptohippie). I’d love to hear what programs you use to protect yourself and secure your privacy! Take Our Guns, But You’ll Never Take… Our CELL PHONES! Well, any laptop should be using full disk encryption. On Windows, Truecrypt would be the protection of choice. On Linux, most modern distributions support encrypted installs. I’m not sure what is available on the Mac. Most modern phones can also be encrypted, so just make sure your equipment is powered down before going through the border. In the US, you cannot be forced to decrypt something – at least in court. I don’t know what would happen if you refused to decrypt something at the border. Maybe that can be your next experiment!